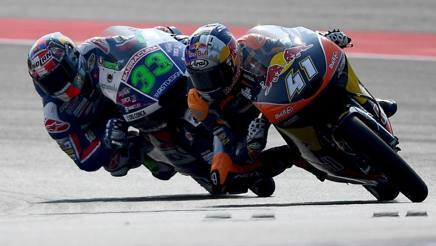 Motogear | MotoGP: Misano; Brilliant battle between Binder & Bastainini! The weekend of Nolan’s home-race in (Misano) went smoothly for the Nolan Group riders, who, as usual, fought inch by inch on one of the most beautiful racetracks in the world. In Moto3, there was a thrilling race between Nolan-Group’s Enea Bastianini and Ixon’s promising world champion, Brad Binder. Both our sponsored riders fought shoulder to shoulder and battled fiercely for the podium. It was an exhilarating close-call and both riders rallied the best out of each other only to showcase the enormity of their respectable talents. Bastianini finished with an incredible 2nd podium as he was tucked right behind the Binder, who once again took the Moto3 win along with an astonishing 106-point lead in the World Championship. In moto 2, Hafizh Syahrin reached 7th place – the Malaysian talent is always very close to the leaders. Danilo Petrucci finished just outside the top ten (despite a great race). Yet the Italian rider was very much focused on paying tribute to his native country. He demonstrated care for his troubled land ( after the recent earthquake) with powerful words painted on his 802RR: ‘shaken but united’, thus portraying a message of solidarity to all the victims effected by the disaster . The helmet will be auctioned and all of the proceeds will go to charity. It was an unlucky race for Five’s sponsored rider Sam Lowes, who after suffering extreme misfortune at Silverstone (where he was knocked off his bike with three laps to go), endured a similar mishap at Misano: the 25-year-old British racer was in fourth position, and aiming for a podium finish when he lost the front end of his bike and was forced to retire from the race.